Seal-Tite® sealants can be used in the harshest operational environments and will maintain their sealing integrity up to 500º F and to 22,000 psi. You can depend on it for high pressure leak repair jobs. Sealants compatible with oil or water/glycol-based hydraulic fluids are designed to solidify only at the high point of differential pressure, so only the leak is sealed. Any excess sealant remains inert, in a liquid form, and will not clog the hydraulic system or other equipment. The environmentally approved sealant can be left in the system indefinitely or flushed out. The pressure-activated sealant technology was originally developed in 1995 to seal leaks in the hydraulic systems of control lines and SCSSVs. 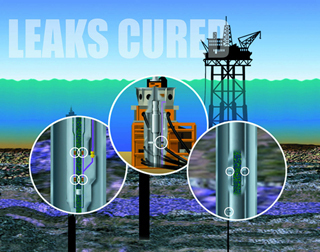 Since then, the proprietary technology has been expanded to cure leaks in many applications including the following. You can view how several of the applications can be applied on our videos and animations page.